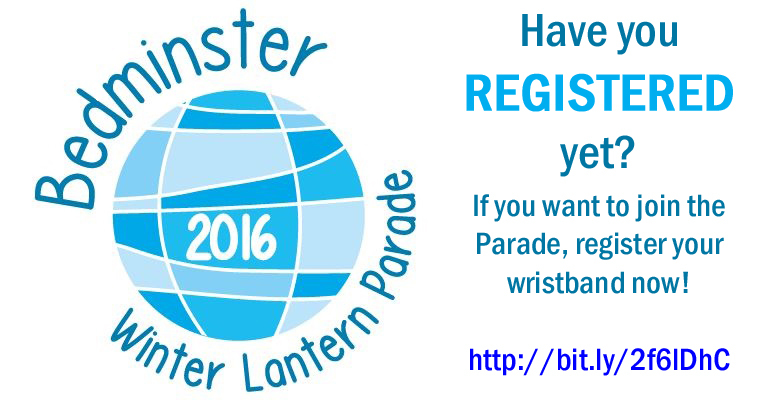 It’s just over a month to go until the start of the 2016 Bedminster Winter Lantern Parade. The lanterns are coming together beautifully and the committee is sorting out logistics, road closures and some surprises for the big day. We’re nearly ready to go…are you? Have you got a wristband? They are important, you know. Why are you asking about wristbands? Why are they important? If you are one of the fab folk who bought one of the official 2016 Lantern Kits, you’ll have yourself a pair of wristbands. These wristbands entitle you to free registration to be part of the Bemmy Mix group and join the Parade on Saturday 10th December. If you do want to join the Parade, it is mega important that you register your wristbands on our registration page before the event. I cannot stress this enough. For insurance purposes. Each year the committee insures the Parade, which covers all registered participants. This includes all schools, community groups and anyone else who is actively participating in the Parade itself. Our insurance won’t cover people who have not registered. Wristband holder who has registered in advance of the parade – shiny! No wristband at all, or wristband and no registration, no cover – no joining the parade. Of course, you don’t have to join the parade if you don’t want to. Everyone coming along to watch are so welcome to create a lantern and bring it along to the event to stand in the crowd. We love to see your beautiful creations lighting up the crowds. it definitely adds to the spectacular atmosphere of the event! Ok, cool. So what do I need to register? Registration is limited only to people who have wristbands. Other members of the public cannot apply to join the Parade this year. So now all you need do is grab the two official Parade wristbands that came in your kit – you need their numbers to register yourself – and fill in the details on the registration page. How many people do my wristbands cover? a child wearing a wristband AND an accompanying adult. And the process? How does that go? If you are an adult, crack on and fill in your information along with the wristband number. Done! If you have 2 adults accompanying 1 or 2 children, fill in each adult’s information along with the wristband number and add the child’s name when prompted. If you are an adult accompanying 2 children, make sure that you put your name on both wristband entries, and add each child’s name when prompted. Apart from turning up with your lantern and, more importantly your wristbands, on the day. Is there an age limit to take part in the Parade? There is no age limit to participation, but any children being registered MUST be accompanied by an adult. Where do I go to join the start of the Parade? Parade participants are to gather at the start of the Parade, which is located by St Francis Church, on the corner of North Street and St Francis Road. Please arrive at this location at 15:30 and no later than 16:00. No, but you must wear your Official Wristband at all times. So there you have it! Register away! If you have any questions, get in touch with us via email or contact us through our Facebook group.